Legend says that tea originated in China in 2737 B.C., over 100 years before the first Egyptian pyramid was built. In this first stop on our tasting tour, we explored China’s best-known tea growing areas in Yunnan, Anhui, Zhejiang, and Fujian provinces. We also took a look at traditional Chinese teaware, including gaiwans and guangzhou teapots. We started out by taking a look at the legend of the history of tea, going back to Emperor Shennong in 2737 B.C., and then talking about the major tea growing provinces of China. Four provinces were represented in our sampling: Yunnan, Anhui, Zhejiang, and Fujian. Obviously, this is just a beginning, but in a single short class, we can’t hit them all. After the background was covered, including varietals of the tea plant, we launched into the individual teas, organized by style. First was white tea, the most lightly processed. 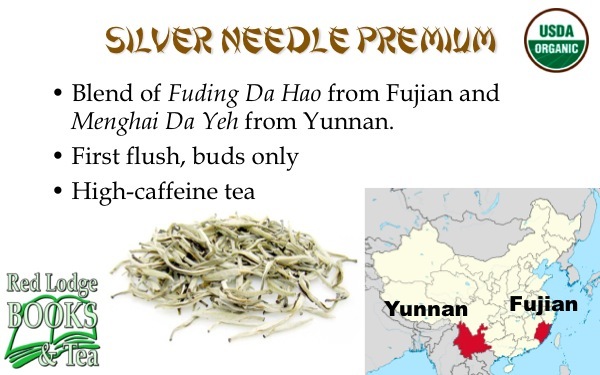 I chose a Silver Needle blend from Rishi instead of a single-origin tea for this one mostly because our focus was comparing Chinese white tea with green and oolong teas. At some point down the road, we’ll do a comparative white tea tasting where the focus will be on terroir and origin. 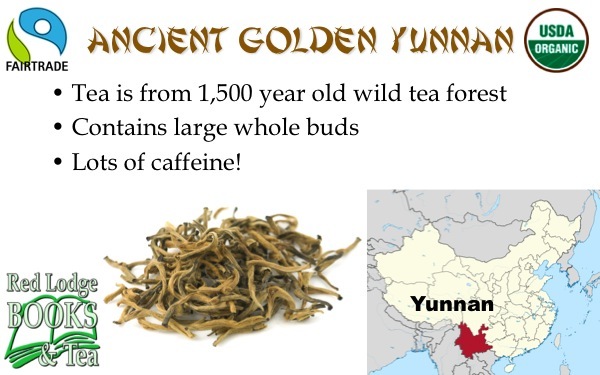 One of the bullet points on the slide is an important one: busting the caffeine myth of white tea. The fact that this tea is made from early-picked buds means that there is a high concentration of caffeine. The preparation style does nothing to change that. The longer steep times we typically use on white tea just accentuates this. We steeped the tea for five minutes in 165 degree water. I chose three different green teas for the tasting. Each brought something completely different to the party. 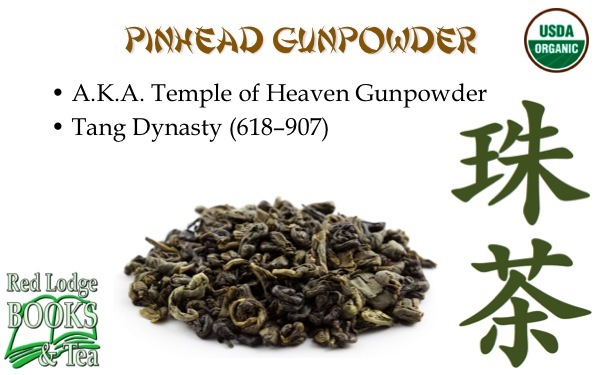 First – a straight green tea very typical of Chinese fare, with a history dating back well over a millennium. 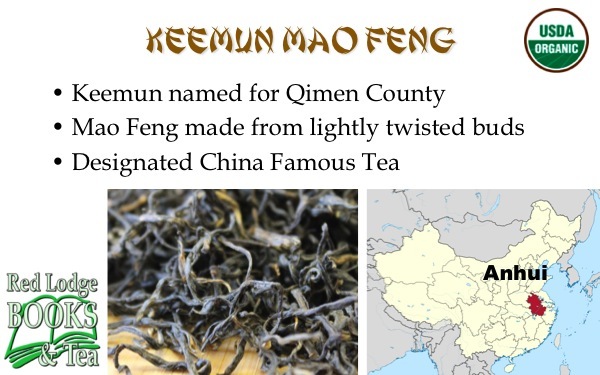 The name of the tea comes from the finely-rolled leaves resembling gunpowder. We steeped the gunpowder tea for three minutes in 175 degree water. I simply couldn’t resist including the original story (fable?) of Longjing tea here, which I’ll be covering in much more detail in the future. Of all of the green teas I’ve tried, this is the one I keep coming back to as my favorite. We steeped the dragonwell tea for three minutes — although I only do two minutes when I’m brewing it for myself — in 175 degree water. And finally, we come to the only flavored tea of the evening. 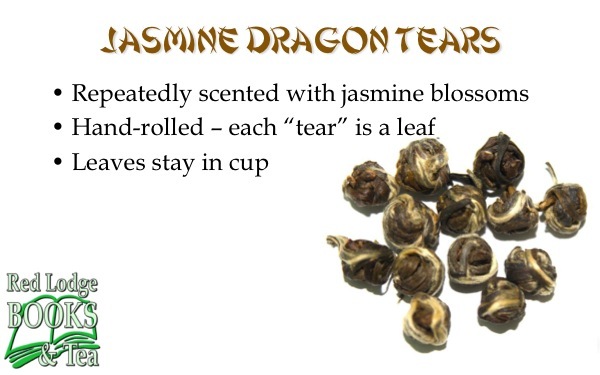 We followed tradition with this tea, placing seven tears in each cup and sipping the tea as the leaves unfurl. Unlike all of the other teas we tasted, this one didn’t have a fixed steeping time. Everyone began sipping after a minute or two and kept sipping as the character changed over the next few minutes. We used 175 degree water. 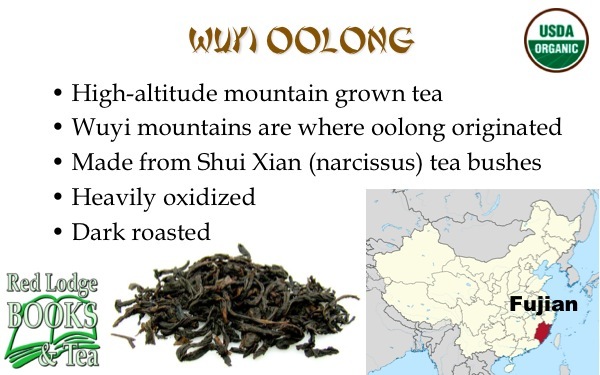 We could have easily set up an entire evening just tasting Chinese oolongs (we are, in fact, doing this with Taiwanese oolongs on March 29), but for tonight we chose only one: an oolong from the Wuyi mountains. It was a very difficult choice deciding which oolong to include. My first temptation was Tieguanyin (Iron Goddess of Mercy), but since I had two rolled teas already I decided to go with an open-leaf oolong. We brewed this for three minutes in 195 degree water. And finally, we moved on to black tea. Choosing only two black teas to represent China wasn’t easy (although it was a lot easier than choosing a single oolong), so I simply went with my two “leaf and a bud” favorites: one fully oxidized rich black with overtones of red wine (Keemun Mao Feng) and one lightly oxidized golden tea from Yunnan. This was another case where I steeped the teas both at three minutes in boiling water for a better comparison, but when I drink them myself I prefer about 2:30 for the Keemun and 4:00 for the Yunnan. We closed out the evening with a discussion of steeping times, water temperatures, multiple infusions, and other factors involved in preparing a great cup of tea. 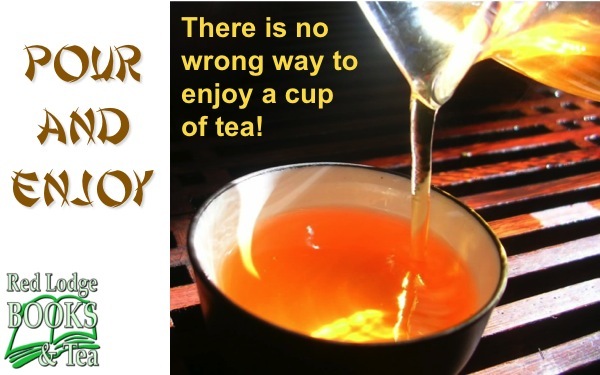 As always, I ended with the admonition to ignore the Tea Nazis and drink your tea however you like it. If you live in the area and were unable to attend this session, I sure hope to see you at one of our future stops on our World Tea Tasting Tour. Follow the link for the full schedule, and follow us on Facebook or Twitter for regular updates (the event invitations on Facebook have the most information). 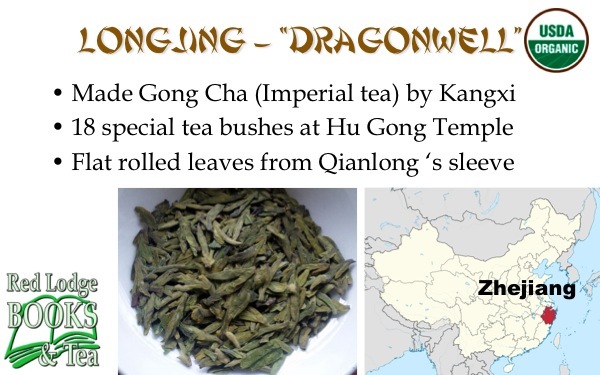 Posted on 28 February 2013, in Styles & Blends and tagged Anhui, caffeine, China, dragonwell tea, Fuding Da Hao, Fujian, Golden Yunnan tea, gunpowder tea, Iron Goddess of Mercy, jasmine dragon tears, jasmine tea, Kangxi, Keemun, Keemun Mao Feng, Longjing, Menghai Da Yeh, narcissus tea, Qianlong, Shennong, Shui Xian, silver needle, steep time, tea, tea tasting, Temple of Heaven gunpowder tea, TieGuanYin, Wuyi oolong, Yunnan, Zhejiang. Bookmark the permalink. Leave a comment.